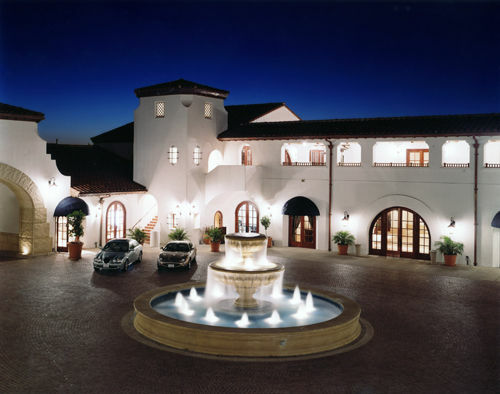 The hotel was farther north than any of us remembered – something to keep in mind when planning dinners in downtown Santa Barbara – but still just as gorgeous upon arrival. Within seconds of entering the foyer, a sense of calm fell over our trio. From the archways and beamed-ceilings to apple-filled bowls and charming bellhops – there’s a welcoming mood in the air here. The bones of Bacara are truly breathtaking. Winding pathways and lush greenery make their way to a finale of quiet Spanish Colonial buildings. Returning to our room in the evening felt like a treat. A well-deserved treat. 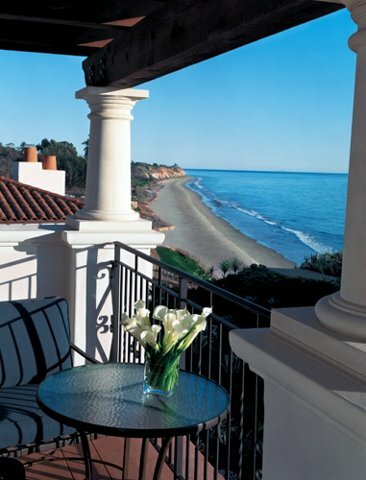 Crisp fabrics in Mediterranean hues and a view of the Pacific created the private serenity of our mini oasis. Not much compares to an ocean breeze, some sliced fruit, a bottle of vino and the company of fine friends at the end of the day. In this respect, Bacara does not disappoint! Nor will you suffer come morning at The Bistro. Experience the surroundings and coastline views al fresco or in the comfort of warm indoor dining. The coffee and oatmeal alone are worth forgoing room service – but it’s the produce brought over from the resort’s own ranch that just might lure you back come lunchtime. The Spa at Bacara took us by surprise collectively. For it not have been promoted with such grandeur, perhaps our expectations wouldn’t have been so high. But as was the case, teases like four levels, 42,000-square-foot, full service facility, heated saline hydrotherapy baths, relaxation libraries with fireplaces and sundeck had long been dancing in heads. Kinda like eating bad pizza, a not-so-great spa experience is still better than no spa experience at all. Downstairs reception aside, the employees inside the locker room seemed scattered and disengaged. Mirroring that of Bacara’s front desk staff, a requisite refinement and professionalism were noticeably lacking here. The steam room was closed (!!! ), the “library” boasted three magazines and the massage room lacked an ambiance one would expect to find at a resort of this caliber. All that aside, it’s easy not to care once submerged in the indoor whirlpool. It’s even easier to forget stepping onto the sand just below the property. A morning walk on the coastline, among the rocks, picking shells and sipping rich coffee can make up for almost any shortcoming in life. Oh my gosh, this place sounds like heaven! It’s been on my “must visit” list forever, thanks for the reminder about this gem in SB! So I’ll bring my own magazines – duly noted. I wonder why the staff is so lackluster? Maybe they should have some of that oatmeal. Thanks for reviewing!